As part of its celebrations, OMC honoured Prof Dhanush Dhari Mishra, former director of Indian Institute of Technology (Indian School of Mines), Dhanbad. BHUBANESWAR: Odisha Mining Corporation (OMC) celebrated its 63rd Foundation Day here on Wednesday. As part of its celebrations, OMC honoured Prof Dhanush Dhari Mishra, former director of Indian Institute of Technology (Indian School of Mines), Dhanbad. Inaugurating the event, OMC Chairman Sanjeev Chopra said phenomenal growth of the Corporation in production of iron ore and all-time high sales turnover of Rs 2,860 crore in the last fiscal were possible due to the business acumen and well-coordinated team work of all employees. The Corporation has contributed Rs 7,107 crore to the exchequer of State and Central Governments in the last five years, which is significant part of the social and economic development spend. It has been paying State Government a dividend of `500 crore every year consistently. Managing Director R Vineel Krishna said the Corporation has held organisation-wide deliberations to undertake a strategic planning exercise ‘Perspective Plan 2025’. It is making best efforts for its production ramp up from 8 MTPA in 2017-18 to 11 MTPA in 2018-19 and 23 MTPA by 2020-21, he said. OMC has been making continuous efforts to maintain quality standards at par with international standards. As the biggest patron of Sports and Hockey in the State, it has committed more than Rs 100 crore to sponsor Indian Hockey Team for the next five years. Meanwhile, OMC has forayed into bauxite mining at Kodingamali mines in the fourth quarter last year adding to its product portfolio in non-ferrous segment. It has also been allotted a coal block and is expected to be operationalised in the next three years. 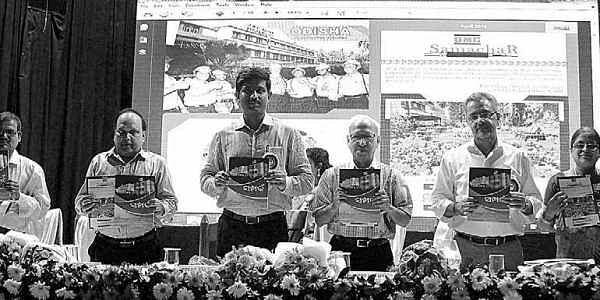 Annual souvenir ‘Sampark’ was released on this occasion.